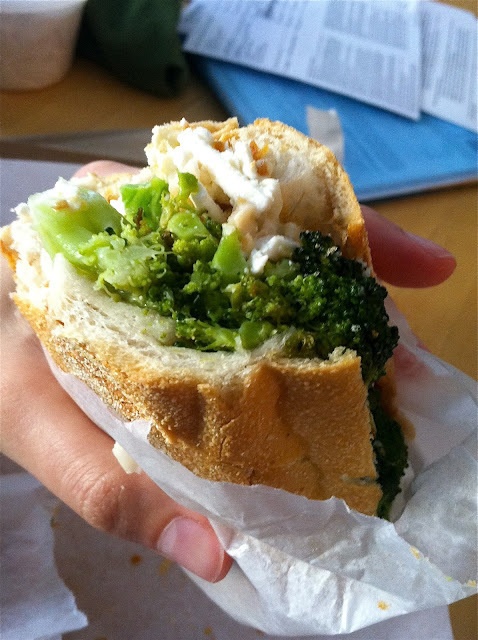 green girl eats: no.7 sub's "broccoli"
When it comes to that time of day when you're ready to take a break from your desk, wander around in the summer sunshine (hot hot heat! ), and find the food your stomach seems to be suddenly demanding, look no further than my new lunch-break Mecca: No.7 Sub. This NYC sub shop has three locations: Greenpoint, Ace Hotel, The Plaza. With fresh bread for their sandwiches coming daily from Caputo Bakery in Brooklyn, all that's left is for these guys to add their magical combinations. For me, I had to go for the Broccoli. I know. I thought that, too. That was before I had a bite of this killer, nonsense combination: broccoli, lychee muchim, ricotta salata, and pine nuts. This was literally the best thing I've ever had in my life. And I texted a slew of my vegetarian friends and told them I found my favorite food. They all think I'm a little nuts, but that's just because they haven't tried it yet. Also? Props to No.7 for having a pretty hefty variety of veggie options. For such a small menu, they don't limit us to just one sandwich choice. There's the Broccoli, Zucchini Parm (heard good things about that one there), Cheese (cherry tomatoes, corn, green olives, scallions, HELLO?) and Mongolian Tofu. Plus they've had other crazy choices on past menus like Roasted Cauliflower and Brussels Sprouts. Dude. No.7 Sub has a deceptively simple strategy that keeps their customers coming back for me. Tyler Kord, both chef and partnered-owner of No.7, describes their combinations: "Each one hits the standard ingredients categories; they just seem weird. It's like salty-sweet-sour-crunchy." Yup. The only one he forgot is awesome.